This soft pretzels recipe appears as the technical challenge in the Finals episode of Season 2 of The Great British Baking Show. Add the flour, salt, yeast and butter to a bowl. In a jug, add the malt extract to the milk and stir to dissolve. Add the milk mixture gradually to the flour and mix until a dough is formed. Turn the dough out onto a clean work surface and knead. The dough should be stiff but not sticky, and shouldn’t need any extra flour to knead. Continue for 10 minutes, or until the dough is smooth and glossy. Divide the dough in half. To one half, add the zest of two oranges and the poppy seeds, and mix through, ensuring even distribution. Leave the other half plain. Place both doughs into separate oiled bowls, cover, and leave to prove until doubled in size (about 45 minutes). Once proved, turn both the doughs out and divide each one into six equal pieces. Using your hands, take each piece, and roll the dough into a long sausage shape, tapering the ends, and creating a slight bulge in the middle. Each piece should be about 40-50cm/16-20in in length. You may need to roll out each of the strands just part way at first, then rest them, allowing the glutens to relax, before continuing to roll them out to their full length. This can help to prevent the strands springing back and creating unevenly shaped pieces. As you roll out the ropes you should apply some pressure to the dough, working from the middle outwards, pushing out any air bubbles that may have formed in the dough. The traditional and quickest way to shape a pretzel is to take hold of each end of the strand and lift it into the air to create a U-shape. Then, without letting go of the ends, and in one swift movement, flip the centre of the U, propelling it to form a double twist. Lay it back down on the work bench and lightly press the tapered ends onto the opposite sides of the pretzel, attaching them either side of the central bulge. You may find a little dab of water helps to stick the ends to the pretzel. 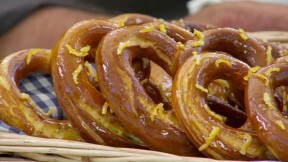 Carefully flip the pretzels over and onto a baking tray lined with parchment paper, so that the ends are now face down. You should now have a classic pretzel shape with three equally spaced sections. Alternatively, shape each rope into a wide U-shape on the work bench. Take the two ends and manually twist them around each other twice before fixing the tapered end pieces to the opposite sides of the pretzel underneath the main circle of the pretzel so that you can’t see the joins. Press down lightly to seal, without misshaping the pretzel. Work quickly to shape all 12 pretzels. Add the bicarbonate of soda to 7 litres/12½pints of boiling water, and gently drop each pretzel into the boiling water for approximately five seconds. Gently remove and place on a baking tray, keeping the different flavours separate. While the plain dough is still wet from the water, sprinkle over the salt and sesame seeds. With a sharp knife, make a deep slash into the thickest part of the dough. Bake in the oven for 20-25 minutes, or until they are a deep brown color. Meanwhile make the glaze for the sweet pretzels. Put the orange juice into a saucepan and add 100g/3½oz sugar. Add the zest, and bring up to the boil. Boil for one minute, then remove the zest using a slotted spoon and roll it in the remaining sugar. Continue to cook the syrup until reduced in volume and sticky. Pass through a fine sieve. Place the baked pretzels on a wire cooling rack, brush the sweet pretzels with the syrup glaze and sprinkle over the candied zest.